Camp Director, Lisa Owens, would like to announce that 2008 Olympian, Dusty Jonas, will now be working with the high jumpers at this years camp. Jonas is a former Junior National Champion, NCAA National Champion, and won a bronze medal at the 2010 IAAF Indoor World Championships. Jonas has a personal best of 7' 8.75". Click on the video below to see a series of Jonas' jumps from the 2008 Big 12 Championship. 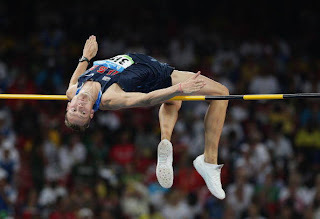 The last jump is where he sets his personal best. Jonas will be replacing Jamie Nieto who will be unable to attend due to a scheduling conflict.